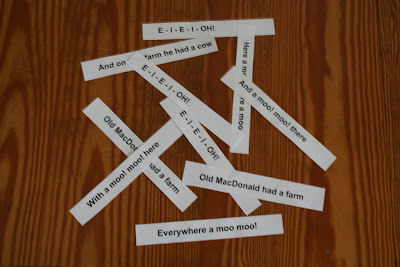 I like to do Song Puzzles with my children who are early readers and those that can use some assistance with sequencing. Start with a song that is very familiar to the child. Print the song line by line preferably on a piece of construction paper. Take the lines of the song and mix them up on a table in front of the child. Using musical prompts (humming part of the song or singing it if needed) encourage the child to identify the first line on down to the end of the song. 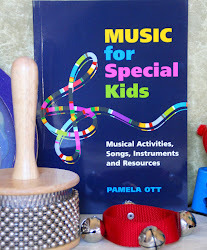 Try to use musical prompts and try to reserve physical prompts (pointing, moving lines or assisting them to move lines) for use if the musical prompts aren't working. 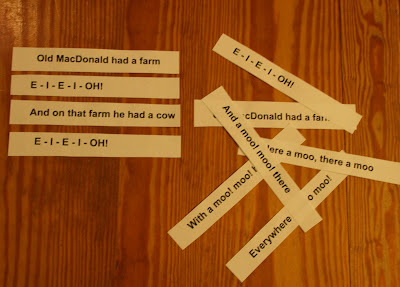 If the child gets really good at putting the puzzle together for one song, try printing lines for two familiar songs and mixing them together!